One of the most often overlooked, but still beautiful and vital, pieces of women’s jewelry is a wristwatch. Sure, nowadays phones can tell you the time, but they can’t do it with the style and grace of an elegant watch! But finding the right style, price, and durability is important. How can you be sure which is the one you’re looking for? 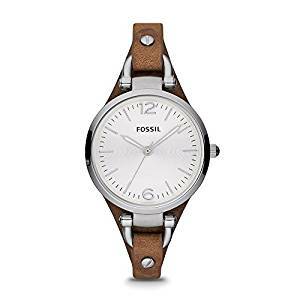 Fossil is a well-known watch manufacturer, though their timepieces are normally associated less with glitz and glamor, and more with sport-like quality and rugged durability. With the Fossil Riley, you can get the best of both worlds! This gorgeous rose gold colored wristwatch has the style of a chic heirloom piece, with the durability that someone constantly on the go needs. Do you hate taking off your watches every time that you shower, or do you prefer to keep it on for quick dips in the pool? This designer-look watch is water resistant up to 330 feet! Just don’t take it scuba diving, and you’ll be fine! The looks are nothing to pass up, either. With a bezel studded with crystals, a fluted crown, and even more crystals in the indices, this watch is all girly-girl pretty, while being tomboy tough. The price is a little steep, and you need to choose the length of the band carefully. But this is a watch anyone will love! Waterproof up to 330 feet. Comes with beautiful crystal details. Comes in rose gold colored. Has a three link band system, for an easy and comfortable fit. With an average price on Amazon being anywhere between $135 and $190, the price is a bit much for those looking to buy on a budget. You need to choose your band lengths very carefully. However, if you do choose one that is too short, you can get two free links from Fossil. All that is required is shipping and handling. If price is no object, then this is a great choice in wristwatch for either yourself or for someone on your gift list. It’s strong enough for everyday wear, but looks beautiful and delicate, perfect for a stylish and useful accessory. The expense will be worth it; this is a watch you’ll wear again and again! Sometimes, you want a pretty watch that doesn’t look too “busy”, something that is simple and elegant. 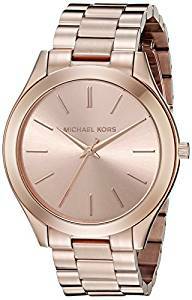 If that seems like what you are looking for, then the Michael Kors Women’s Runway Rose Gold-Tone Watch MK3197 is a great option in a lady’s wristwatch. Constructed out of stainless steel, this rose gold colored watch is as durable as it is elegant. With a mineral glass dial window covering the rose gold colored face, this is a timeless beauty that will look as fashionable in twenty years as it does today. And this isn’t a delicate watch, either! With a water resistance that goes up to 165 feet, you can leave this watch on in the bath or shower… or even leave it on for short recreational swims! For a mid-range price of approximately $100, this is an amazing watch. The only design flaw might be that it’s a bit larger than others, which can make it more cumbersome. This watch is waterproof up to 165 feet, meaning it’s fine to wear in the bath, shower, and for short recreational swims, but not for scuba diving or snorkeling. Comes in rose gold colored stainless steel, for both beauty and durability. Has a fold-over clasp that comes with double push-button safety features. Has a mineral glass cover. For women with smaller wrists, the size of the watch might be an issue. The timepiece itself is a bit big, and the band might require you to have a few links removed. 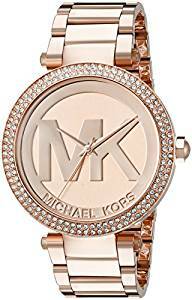 For a beautiful, chic, and timeless wristwatch that can also take the wear and tear of everyday use, the Michael Kors Women’s Runway Rose Gold-Tone Watch MK3197 is a perfect choice. It’s mid-range price makes it a great option for all budgets, and the durability means that it will last for a long, long time. Everybody likes a good piece of name-brand jewelry every now and again. If you want to show off having something from a famous designer, while still looking elegant and fashionable, the Michael Kors Watches Parker Women’s Watch is a great choice! Emblazoned with the famous Michael Kors logo, this rose gold colored stainless steel watch is sure to be a great choice for even the most brand-conscious. If that wasn’t enough, the gorgeous, timeless beauty of the watch, including the inlay of diamond-look crystals, makes it great for both everyday use and for more fancy looks. But just because it looks good, that doesn’t mean that it isn’t a highly functional, strong watch! This stainless steel beauty is also water resistant up to 330 feet. Basically, as long as you don’t try to go scuba diving with the watch on, it should be safe in water! The price is a bit much, true, but this is a watch that should last for years to come. This watch is water resistant up to 330 feet, making it a great choice for those who wear jewelry in the bath or shower. You can even take it swimming and snorkeling! Is part of the famous Michael Kors line. Comes emblazoned with the bold Michael Kors logo. Has two rows of diamond-look crystals surrounding the watch face, for an added bit of shimmer. Made of rose colored stainless steel, for added strength and durability. With a price on Amazon between $112 and $134, this is one of the more expensive watches. 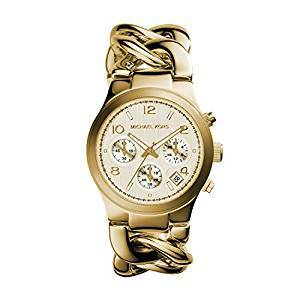 The Michael Kors Watches Parker Women’s Watch is a brand-conscious woman’s dream come true! It’s a beautiful, durable piece of jewelry that proudly shows exactly who made it. The rose colored stainless steel means that it will last years to come, and the water resistance means that you don’t have to worry about getting it wet. This is a great, if a bit expensive, choice! There are times when function is much more important than fashion. And, for some women, they aren’t looking for a glitzy or fashion-forward watch. 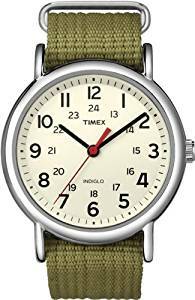 If this is true of your tastes, or the tastes of the person you’re buying a watch for, the Timex Unisex Weekender Analog Quartz Watch is an excellent choice. With a cream-colored watch face and an olive-colored nylon strap, this is great for the more tomboyish fashion sense that some people prefer. Function, though, is the biggest feature. It tells both standard time and military time, and the strap holds it in place very well, preventing slipping an sliding. The price is another great feature; you can expect to pay approximately $30 for this watch. Considering Timex is a famous name in wristwatches, that’s a steal! The only real downsides are the larger size, which some find uncomfortable, and what has been described as loud ticking. The average Amazon price that you can expect to pay is $30, which makes it one of the least expensive watches on this list. The nylon wrist strap makes it a durable option in ladies’ wristwatch. The size of the watch itself might be a bit too large for some people’s tastes, making it cumbersome to wear. While water resistant enough to handle quick splashes of water (100 feet), it can’t be worn in the bath, nor for swimming of any kind. The ticking is rather loud, which is something some people don’t prefer. Though you can’t get it wet, this is still a durable, nice watch for women who don’t want something too flashy, but want something that will actually work well. It’s made by a famous watchmaking company, Timex, and costs as little as $30, making it an amazing bargain to boot. One of the biggest problems with finding a watch for a woman is finding one that isn’t too large on her wrist. This is an issue that many of the watches in this very list have. But, with the Fossil Women’s ES3060 Georgia Three Hand Tan Leather Strap Watch, that isn’t an issue at all! The face is small enough that it won’t completely dwarf your wrist, and the band itself is thin enough that it doesn’t look like you’re wearing a man’s watch. The fashion of this wristwatch doesn’t end there, however. Any woman who grows tired of only being offered glittery or girly watches will love being able to wear this one with its leather band and classic face. They’ll also enjoy the fact that it is water resistant up to 165 feet. The price varies quite a bit, though, making it hard to know how much you’ll spend. This watch is water resistant up to 165 feet, meaning that you can wear it in the bath or for short recreational swims. The effects on the leather are not abundantly clear. The watch itself is made out of stainless steel, while the strap is made out of leather. Comes with a buckle closure for secure wearing. Because the average price that you’ll pay on Amazon differs so much, knowing how much you’ll pay for it is a bit of a mystery. You can expect that it will cost anywhere from $54 to $105. 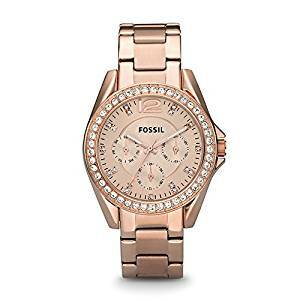 For women who prefer classic and a bit of edge instead of shimmer and shine, the Fossil Women’s ES3060 Georgia Three Hand Tan Leather Strap Watch is a great choice. Though the price can be a bit difficult to lock down, it isn’t on the higher end. However, the features of this watch are definitely on the higher end, making it a perfect wristwatch. The gold watch is a classic. It’s something that works with almost any style, and can look good on almost any wearer. If you’re one for the classics, or are buying for someone that is, then you should look no further than the Michael Kors Watches Darci Watch. This watch, made out of gold plated stainless steel for that luxurious gold look, is made by the famous brand Michael Kors, the name brand really making it stick out from the crowd. The stainless steel makes it very durable; this is a watch that will last for years to come. The dial window is made out of very strong mineral glass, making it difficult to break or scratch, adding to its durability. The only real downside of this watch is the price. Costing on average $140 to $275, this is one of the most expensive watches on this list. Made of very sturdy stainless steel, and with a dial window made out of mineral glass, this is a watch that should last you for years to come. Timeless gold design means that it won’t ever fall out of fashion. On Amazon, you can expect to purchase this watch for anywhere between $140 and $275, making it an expensive watch to buy. There is no mention of it being waterproof or water resistant, so it’s best to assume that you can’t get it wet. This means you can’t wear it in the bath, like other watches on this list. If you or the person you’re buying this watch for prefer the classics, and want something that will last them longer than a few months, then the Michael Kors Watches Darci Watch is an excellent choice. The watch is both durable and beautiful, though the price is on the higher end of the spectrum. There’s something to be said for the elegant, daring combination of black and gold coloring. If that’s more your style than a girly or rugged watch, then the Anne Klein Women’s AK/1980BKGB Diamond-Accented Dial Black and Gold-Tone Bangle Watch is a great fit for you! This bangle watch has a band that is a mixture of filled black enamel and gold tone stainless steel, providing it a sleek, glossy, elegant look. The face of the watch is black enamel, as well, with gold tone hour markers at three, six, and nine, as well as a crystal marker at twelve. The simplicity of the style makes it a beautiful look for both evening and daytime wear. But it isn’t just pretty: It’s highly functional! You don’t even have to worry about it getting wet: It’s water resistant up to 99 feet! At an average price on Amazon of jut $60 to $75, this is likely the best budget women’s watch that you’re likely to find on this list. It is water resistant up to 99 feet, meaning that you don’t have to worry about the occasional splash, or even washing your hands. This watch is made out of black enamel and gold tone stainless steel, for durability and style. Comes with gold tone stainless steel accents, as well as a diamond-look crystal accent. Though it is water resistant, as mentioned above, you shouldn’t take it swimming or wear it in the bath. The Anne Klein Women’s AK/1980BKGB Diamond-Accented Dial Black and Gold-Tone Bangle Watch is probably the best low budget women’s wristwatch on this list. It’s beautiful, elegant, and very functional. You can’t go swimming with it, but washing your hands shouldn’t be an issue. If you want sleek and simplicity, combined with form and function, this is it! Sometimes, convenience is the most important thing. If the same can be said for how you feel about a women’s wristwatch, then the Seiko Women’s SUT116 Stainless Steel Two-Tone Watch is a great choice for you. The most impressive feature of this watch is that you don’t have to worry about replacing batteries, or the watch suddenly dying out of nowhere: It runs on solar power, so all you have to do to keep it powered is expose it to a bit of light! And this watch can do more than just tell time: You can set the date, as well, so you’ll never mix up your days again. But you can’t forget the style aspect of this watch, either. The classic look of this watch, combined with the gold tone and silver tone stainless steel makes it a stylish choice in a watch. Made out of stainless steel in both gold tone and standard stainless, this dual tone is a very classic fashion statement. Runs off of solar power, so you don’t have to worry about buying and replacing batteries. This watch is designed to be able to tell you the date. Though it can withstand splashes of water, such as from rain or washing your hands, it can’t handle being taken swimming, or into the bath. The average price of this watch on Amazon is between $119 and $215, making it a more high-end and expensive timepiece. The Seiko Women’s SUT116 Stainless Steel Two-Tone Watch, while a bit expensive, is one of the better classic watches that you can buy. However, the real reason to purchase this watch is for the convenience of never having to replace a battery and never having to guess what the date is again! Gold truly is a classic when it comes to watches. But why not try a gold watch with a twist, for a more daring take on the old standard? If you’re in agreement with that, then the Michael Kors Women’s Runway Gold-Tone Watch MK3131 is likely to be the ideal choice in wristwatch for you! Made out of durable stainless steel, this gold tone watch draws the eye, both because of the stunning color and because of the unique shape of the band. But there is quite a bit of function to go with the haute fashion of this watch. For one, this timepiece is water resistant up to 165 feet, making it safe to take short swims in, or to just take into the bath. Have trouble remembering the date? This watch can show it, making it a very convenient choice! Made out of gold tone stainless steel, for added durability. This watch can shows not only the time, but the date, as well. Is water resistant up to 165 feet, making it safe to bathe in or to take short swims in. Made by famous brand Michael Kors. The band of this watch is a bit on the bulky side, making it uncomfortable for some women to wear for long periods of time. The face of the watch might seem a bit too small, especially when contrasted with the rather large band. 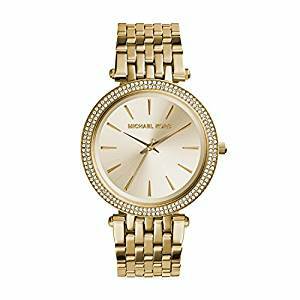 For those looking for a watch that will stick out of a crowd, but will look good and perform well while doing so, the Michael Kors Women’s Runway Gold-Tone Watch MK3131 is a perfect choice. The stainless steel is sturdy, but beautifully colored a gold tone, while the function of the watch has everything you could want. The Anne Klein Women’s AK/1362RGRG Rose Gold-Tone Diamond-Accented Bracelet Watch is another beautiful watch by the famous brand, Anne Klein. This watch is made out of stainless steel that has been colored to a romantic shade of rose gold. The style is very sleek and modern, while also being timeless, beautiful and feminine. There are rose gold bars at the three o’clock, six o’clock, and nine o’clock positions, and a single shimmering diamond found at the twelve o’clock position. And, because you’ll want everyone to know what brand you’re wearing, you can find the Anne Klein logo and brand name on the face! The only real problem with this watch is that, unlike the other watches on this list, this is not water resistant at all. This means that you’ll need to protect it from the rain, as well as taking it off even to just wash your hands. Made out of durably stainless steel, this watch is strong enough to last you for years. 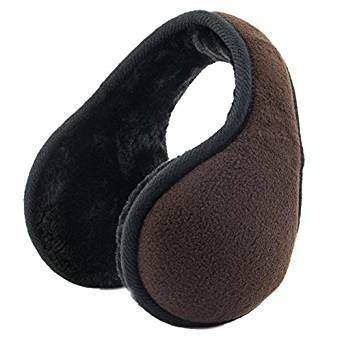 Comes with a jewelry clasp closure, for a secure, comfortable hold. Name brand is located on the face of the watch. Has a sunray style dial, with a single diamond located on the twelve o’clock position. This watch is not water resistant at all, meaning that you’ll have to take extra precautions to avoid getting it wet. The band can be a bit short, but additional links are available to ensure the proper fit. 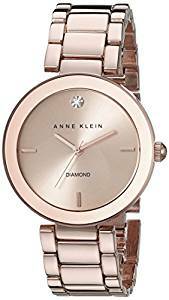 If you don’t mind having to protect it from water, the Anne Klein Women’s AK/1362RGRG Rose Gold-Tone Diamond-Accented Bracelet Watch is a stylish, very modern looking option for a ladies’ watch. The rose gold color is beautiful, and the single bright diamond in the setting makes a truly beautiful statement. Finding the right women’s wristwatch, either for yourself or for someone else, can be tricky. But, with such a wide array of styles, features, and prices, you can find something that is sure to work for you. Whether you like timeless beauty, modern ruggedness, or elegant and sophisticated, there’s a wristwatch that’s perfect for you!